Heavy shade areas give gardeners big problems. Finding shrubs that do well on less than three hours of sun a day is not an easy task. Shrubs that do well in heavy shade may not produce as many flowers as they do with more sunshine and the colors of the leaves may not be as bright, but they will grow and thrive, filling in an otherwise empty spot. Leatherwood (Dirca palustris), also known as wicopy and ropebark, usually grows to about 4 feet tall, but can get up to 8 feet. The name comes from the soft leather-like consistency of the shrubs, which bend so much they can be tied in knots. Deciduous, elliptical leaves grow from 2 to 3 inches long and turn a lemon-yellow color in the fall. Yellow flowers bloom before the leaves put in their appearance and give way to green-yellow berries. Plant leatherwood in partial or full shade and a rich, moist soil. The plant is hardy in USDA Zones 4 to 9. Japanese kerria (Kerria japonica) does equally well in sun or full shade. The shrub grows from 5 to 6 feet tall, becoming round as it matures. Leaves start out as a medium-green, change to a darker-green over the season and finally chartreuse in the fall. Golden-yellow flowers bloom profusely in April and May and then sporadically throughout the summer. This member of the rose family is native to China, is hardy in USDA Zones 4 to 9 and likes a rich, moist , well-drained soil. Gray dogwood (Cornus racemosa) is native to the Eastern and Midwestern United States and Southern Canada and is hardy in USDA Zones 5 to 8. The plant grows to 8 feet tall and about the same in width. Medium green leaves grow to about 3 inches and become green, purple and red in the fall. Cream-colored flowers grow in clusters 2 inches in diameter for just one week in May or June and are followed by white or blue clusters of fruit that are quickly gobbled up by birds and squirrels. Gray dogwood grows in all sun and shade conditions and likes a soil that is moist and well drained, but is adaptable to other conditions. Japanese yew (Taxus cuspidata) is native to Japan, Korea and Manchuria. 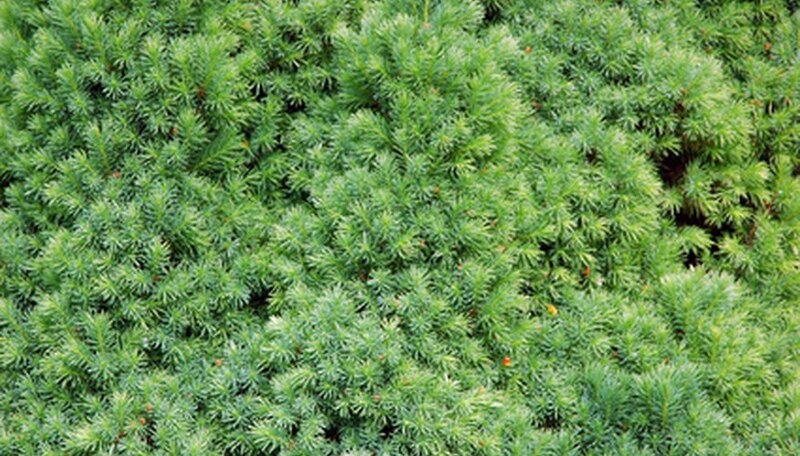 The shrub is an evergreen that grows from 10 to 40 feet tall with a spread that is at least the same. Thin needles grow from ½ to 1 inch long. Flowers bloom in April and May followed by a red berry. Japanese yew does well in sun or shade and a soil that is moist and well-drained. The plant is hardy in USDA Zones 4 to 7.